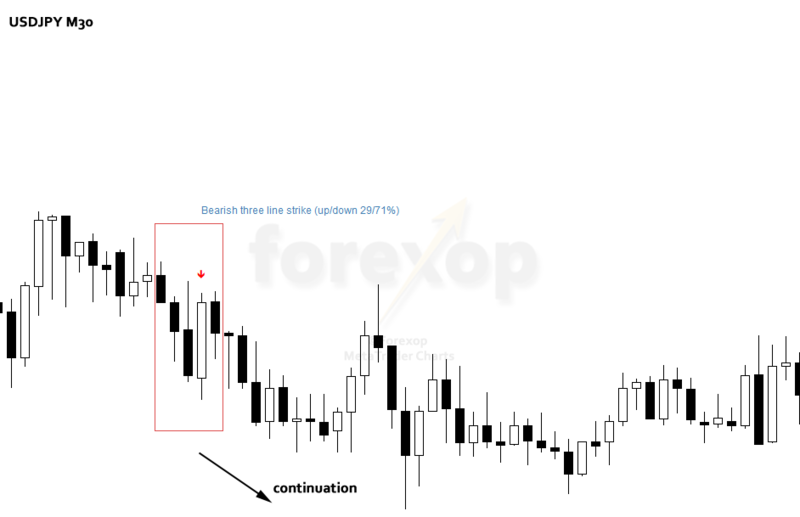 A three line strike is a continuation group of candlesticks that has three in the direction of a trend followed by a final candle that pulls back to the start point. Traders use the three line strike as an opportunity to buy at a recent trend low or sell at a recent high. The bullish three line strike is made up of three strong bullish candles that close progressively higher followed by a final “strike” candle. The strike candle is bearish and opens at or higher than the third candle but closes at least below the open of the first candle. 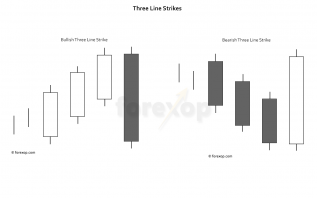 A bearish three line strike is the reverse with three strong falling candles that close increasingly lower followed by a single bullish strike candle. The strike candle should open at or lower than the close of the third candle and close above the open of the first candle. 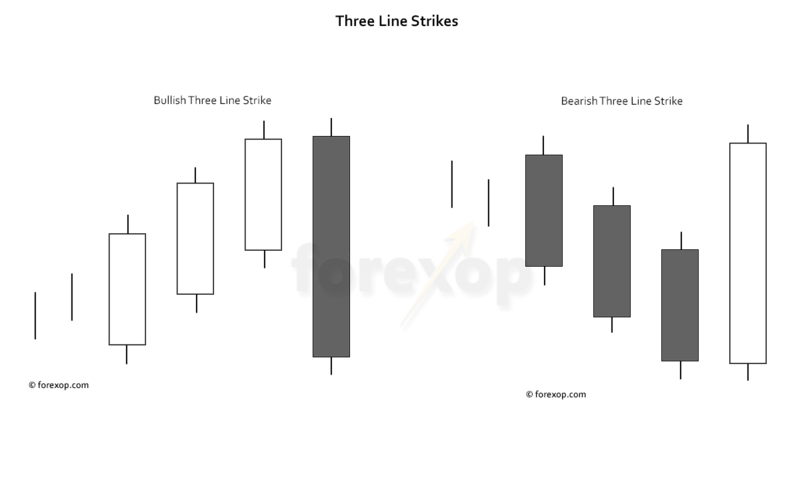 Three line strikes, using the above definition, are rarely found in forex charts. For an alternative looser definition, in the bullish pattern the low of the strike candle can retrace down to at least the open of the first candle. In the bearish three line strike, the high of the strike candle should retrace up to at least the open of the first candle. Some tolerance is normally given around the levels. For a valid pattern, confirm that the first three candles have full bodies, and are at least of average size. They should have a defined stair-case like appearance. Patterns made up of doji and significantly smaller candles may not be as reliable. A bullish three line strike can be treated as an extension of a three white soldiers and a bearish three line strike an extension of a three black crows group. The trading assumption behind the three line strike is that the strike candle is a temporary correction and the trend will follow the direction of the first three candles. The pull back at the strike candle is a reaction to the strong move in the first part of the pattern. Buyers use the low point of the pattern as an entry opportunity. Sellers use the high point of the pattern as an opportunity to sell high. In a bullish three line strike, the strike candle draws in new buyers who try to enter the trend at a lower low. 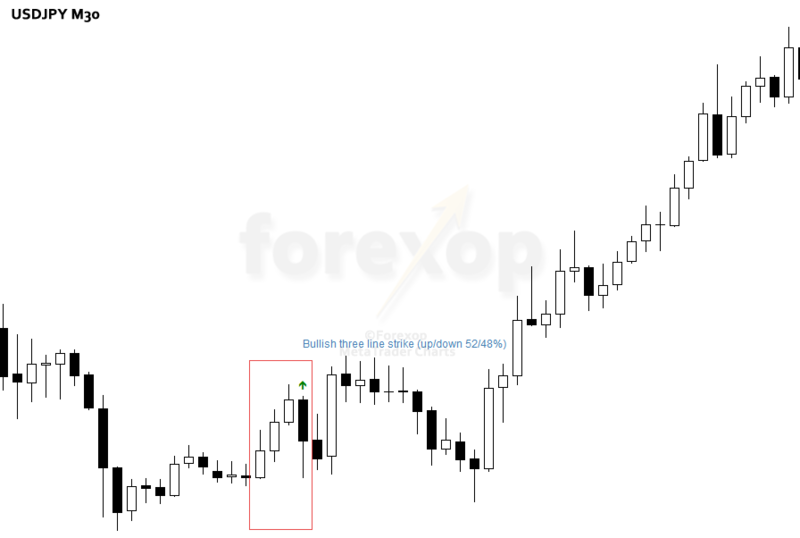 In the bearish pattern the strike candle draws in new sellers aiming to sell at a high point in a falling trend. A continuation in the original direction is likely after the strike candle, especially if a trend is already established. 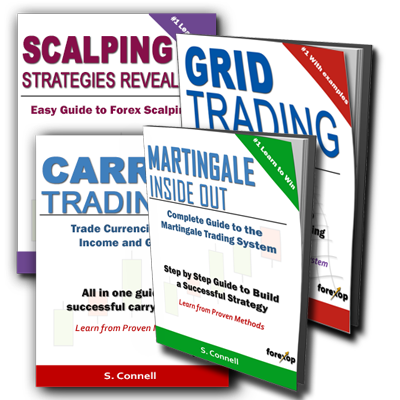 The three line strike is not a common pattern in forex. That makes it difficult to judge its reliability, especially on daily charts and higher. The table shows the reliability of bullish and bearish three line strikes on six main forex pairs over a ten year history. The data are from the hourly chart. The percentages show the proportion of correct predictions. As an overall average, the bearish pattern was accurate 64 percent of times. The bullish three line strike was accurate 53 percent of times. As shown in this analysis a three line strike can trade better as a contrarian flag in some situations. Buy on the sell signal and sell on the buy signal. The trading rule should depend on the chart after some inspection. This chart locates a bullish three line strike on USDJPY. The first three candlesticks line up in a three white solders formation. A buy signal is confirmed when the low of the black, strike candle reaches below the open of the first candle. The trend reaches a lower low a short time after, but the signal from the pattern generates a good entry point for a buy into the trend. This next chart illustrates a bearish three line strike, again for USDJPY. Here the high of the strike candle doesn’t reach the open of the first candle, but is within tolerance, and close enough to be classed as a bearish continuation. Here the bears use the rise on the strike candle as an opportunity to sell into a down trend.